Press Release (ePRNews.com) - North Hollywood, CA - Feb 11, 2017 - North Hollywood bathroom and kitchen store, Polaris Home Design have added a brand-new line to their offering. 2017 sees the home design retailer introduce an exclusive new collection of custom bathroom vanity cabinets, designed to work with any décor and space. The new range features 20 different sizes and various configurations so that they can be installed into any area. The emphasis of this new line is on choice, with Polaris putting together a collection of single bathroom vanities and double bathroom vanities in modern and traditional designs. This new line offers customers the chance to select and customize the style of vanity cabinet that works best for the look and needs of their home, whether choosing antique, wall-mounted or even free-standing varieties. Bathroom vanities are an essential part of any home, but that doesn’t mean they can’t be chic and well constructed. 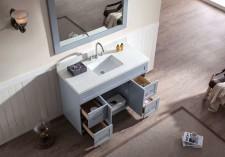 Options include vanities with multiple compartments and drawers for those who require maximum functionality and storage, right down to open-style modern bathroom vanities. Polaris haven’t overlooked the importance of color in their range either. There is a host of shades available for customers to choose from, including monochrome black or white as well as all shades in between such as oak, espresso and dark cherry. Homeowners can also invest in matching custom countertops, designed to complement any style of vanity cabinet and sink. Countertops can be created from a range of materials including marble or granite, popular with traditional bathroom vanities as well as durable and contemporary quartz available in plain, stone or sparkling variations. A company spokesperson said: “We are delighted to be able to bring more lines to our offering. Bathroom vanities are an essential part of any home, but that doesn’t mean they can’t be chic and well constructed.